Mug shot of Nathuram Godse, the man who killed Gandhi. May 12, 1948. By the late 1940s, Mahatma Gandhi was an icon both in his native India and across the globe for his activism in working toward freeing his country from British colonial rule. His nonviolent ideals and leadership of the Indian Independence movement had gained him hundreds of thousands of devoted followers. But some of his beliefs also gained him opponents — and Nathuram Godse, the man who killed Gandhi, was ultimately the most zealous opponent of them all. Late in the afternoon of Jan. 30, 1948, Nathuram Godse walked up to Gandhi before a prayer service in New Delhi and shot him three times in the chest. With that, the great leader was dead, but the infamy of the man who killed Gandhi lives on to this day. 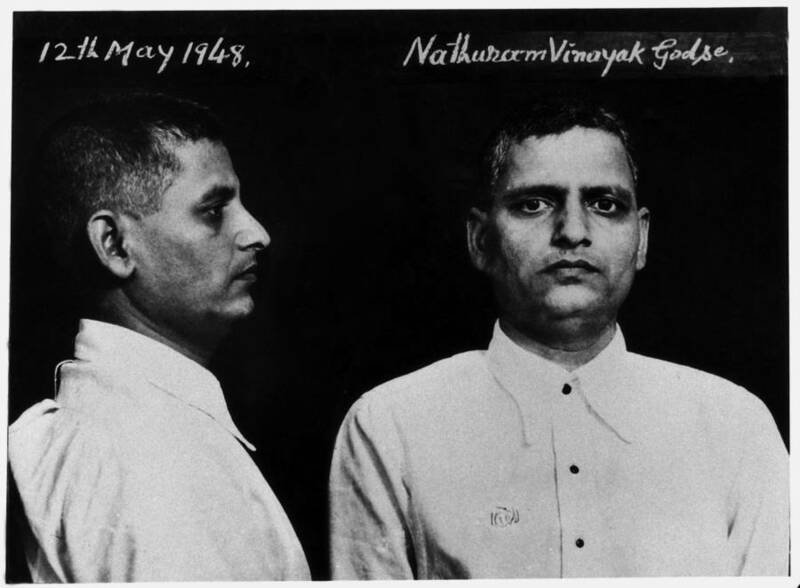 Nathuram Godse was born on May 19, 1910, to parents Vinayak and Lakshmi in an orthodox Brahmin family in India. Godse was the fifth child and the fourth son, but his three brothers before him had all died in infancy. Because only his sister had survived, his parents believed that their male children were cursed, with the only way to get rid of the curse was to raise their next son as a girl. So when Godse was born, he was named Ramchandra, his nose was pierced so he could wear a nose ring, and he was raised as a girl. His name was shortened to “Ram” and his parents began to call him “Nathuram” which means “Ram who wears a nose ring.” Finally, after his younger brother was born, his parents began to raise him as a boy. As a child, his family believed that he had special oracular powers. He would sit in front of the family goddess, fall into a trance, and reportedly serve as a medium between his family and the family’s deity. Even though he was raised as a girl in his early upbringing, Godse grew into a burly young man who took pride in his athletic abilities. Meanwhile, he enjoyed reading but was not a good student. In fact, he ended up failing his matriculation exam, which was an essential qualification in order to earn a low-grade government job. 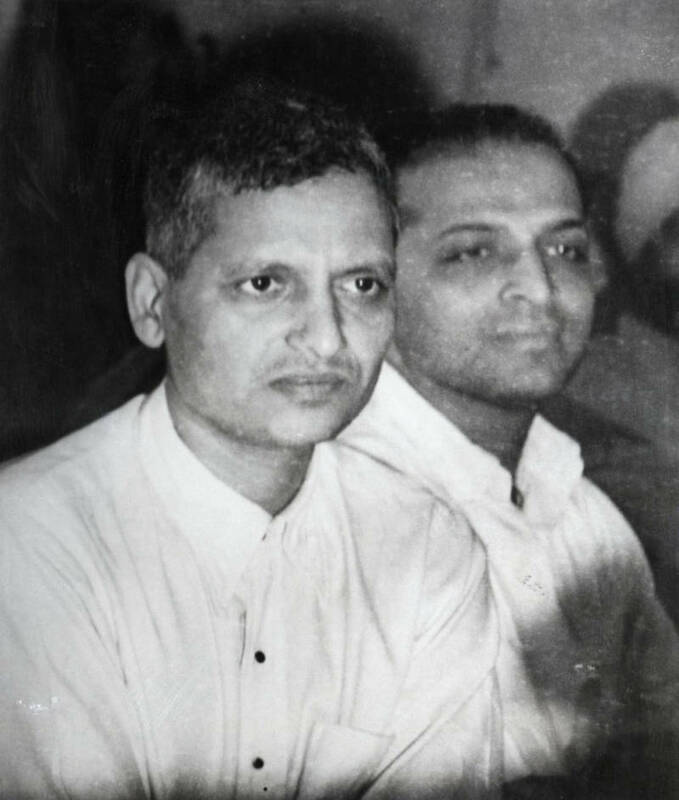 Nathuram Godse and Narayan Dattatraya Apte. In 1929, the 19-year-old Godse’s life was about to change forever when he and his family moved to Ratnagiri, a small town on the west coast of India. It was here that he fell under the influence of Vinayak Damodar Savarkar, a political prisoner who called for an armed uprising against the British. Savarkar would eventually be the President of the Hindu Mahasabha, the extremist Hindu nationalist party of which Nathuram Godse, the man who killed Gandhi, would later become a devout member. Nathuram Godse’s extreme political beliefs led him to become a member of the Rashtriya Swayamsevak Sangh (RSS) and Hindu Mahasabha, both right-wing Hindu nationalist parties that emerged from the Indian Independence Movement. The ultimate aim of the Indian Independence Movement, which Gandhi led, was to end the occupation of the British empire in India. But from this emerged a variety of organizations from all points on the political and ideological spectrum. On one end was the All India Muslim League, which wanted a separate Muslim-majority nation-state in Pakistan. On the other end was the RSS and the Hindu Mahasabha, which were both Hindu nationalist organizations that didn’t want cooperation with Muslims. At first, Godse was an active member of the RSS. The organization’s leader, Keshav Hedgewar, was extremely against Gandhi’s politics of nonviolence and his willingness to cooperate with Muslims in the struggle against Britain. Godse would eventually leave the RSS for the Hindu Mahasabha, the organization from which the RSS drew a heavy amount of influence. In his book, At The Edge Of Psychology: Essays In Politics And Culture, political psychologist and social theorist Ashis Nandy said that Godse did not find the RSS militant enough for him and “he found a more legitimate expression of the Hindu search for political potency” in the Hindu Mahasabha. Godse also founded and ran a newspaper for the Hindu Mahasabha called Agrani that he ran with Narayan Apte. Both of these men would soon go on trial for Gandhi’s murder. India achieved independence from Britain on Aug. 15, 1947, but the religious infighting persisted. As Hindus and Muslims clashed, Gandhi fasted and visited troubled areas in an effort to help fix the religious rift in the country. During one of those visits to New Delhi on Jan. 30, 1948, Nathuram Godse would earn his place in history as the man who killed Gandhi. 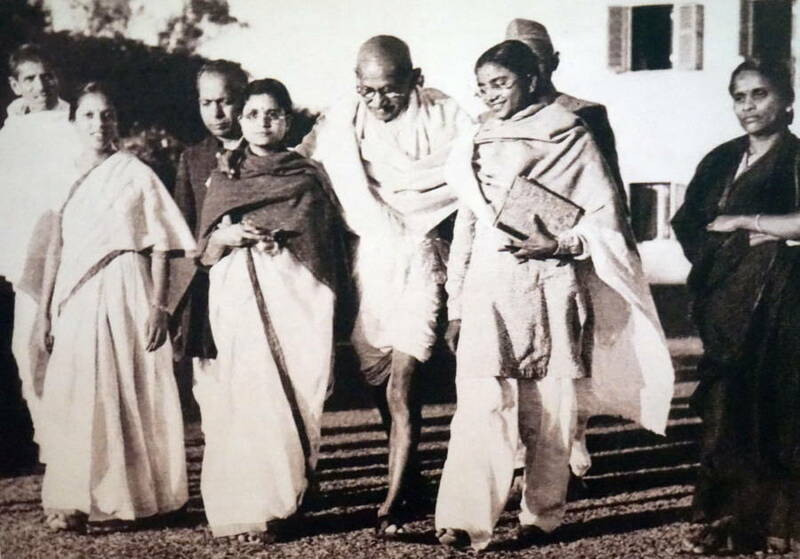 Gandhi was walking through the Birla House with his two grandnieces, Manuben and Abha, around 5:15 p.m. He was coming from a previous meeting which had run a little long so he was already late to the prayer location when a man wearing a khaki dress pushed his way through the crowd and bowed in front of him. Gandhi at his last public gathering with his grandnieces in the Birla House garden on Jan. 30, 1948 — moments before he was killed. The man blocking Gandhi’s path was Nathuram Godse. Without a word, Godse pushed Manuben aside and then fatally shot Gandhi with three bullets to the chest. Manuben recalled that Gandhi only said one phrase before he died, “Hei Ra…ma! Hei Ra…ma (“Oh, God! Oh, God!”)!” — although this is highly contested. As for what happened next, some reports say that Godse surrendered and asked for the police to arrest him. However, other reports paint a more violent scene where Godse was swarmed by the crowd and beaten until he was apprehended by the authorities. Nathuram Godse was quickly arrested for his crime and sent to jail to await trial. 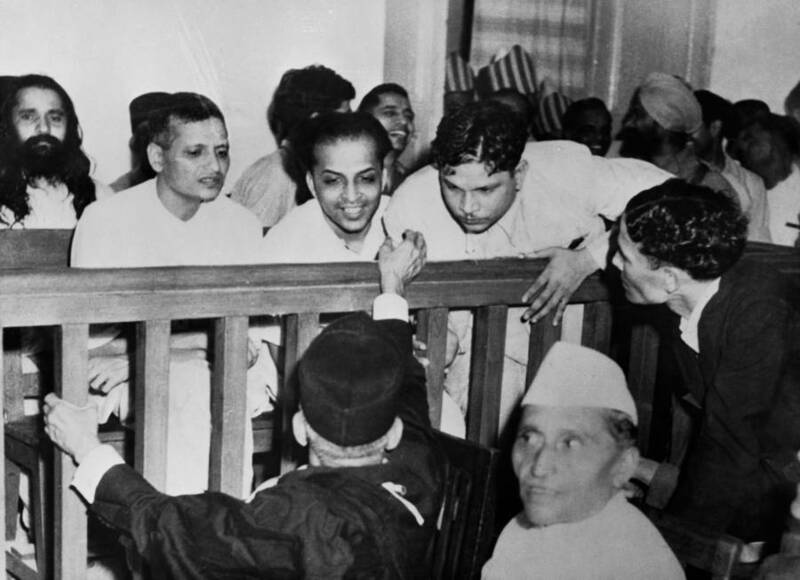 Some of the accused talk to their defense counsel before their trial for the assassination of Mahatma Gandhi. Left to right are Nathuram Godse, Narayan Dattatraya Apte, and Vishnu Rama Krishna, while the bearded man in the second row is M. Badge. But at the heart of all of Godse’s reasons for carrying out the assassination was one thing: Gandhi’s support of Muslims. 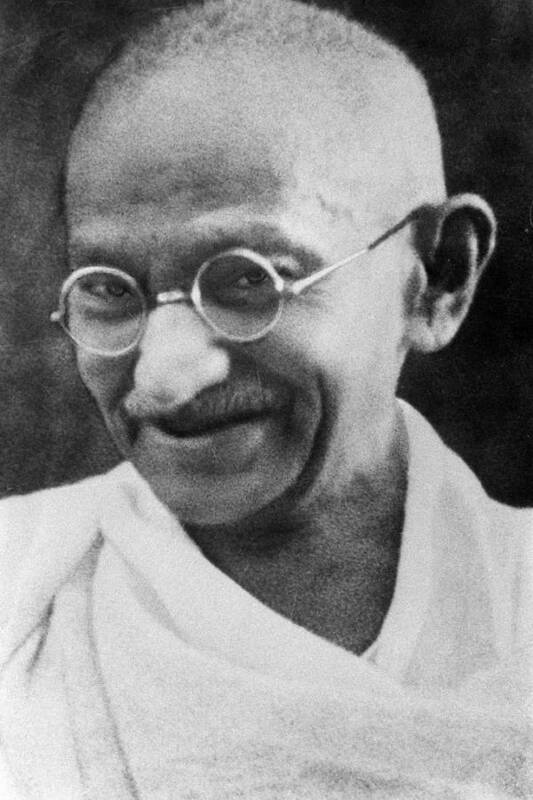 The man who killed Gandhi completely confessed to his crimes and told the court that he would fully accept whatever punishment they gave him. Ultimately, Godse and Narayan Apte were sentenced to death by hanging, a decision that Gandhi’s sons tried to fight because it went against their father’s beliefs. However, their attempt to save the men from the death penalty was unsuccessful and Godse and Apte were executed on November 15, 1949. 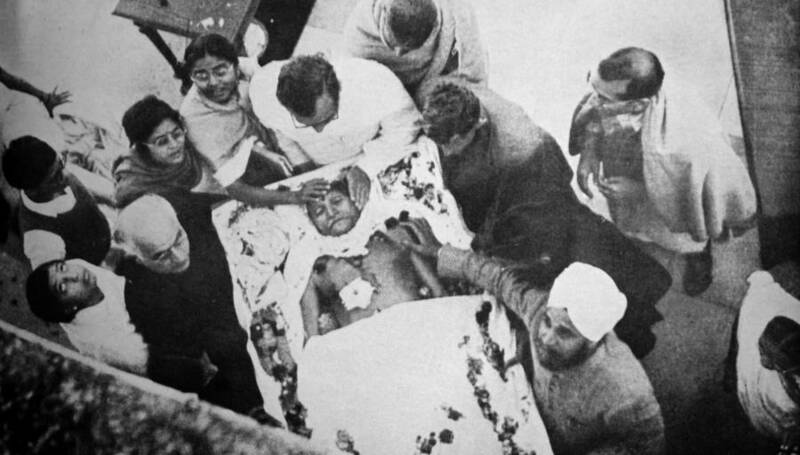 Gandhi’s assassination had both an immediate and lasting impact on India. According to Claude Markovits, author of The UnGandhian Gandhi: The Life and Afterlife of the Mahatma, his death was used in politics as a method of persuasion. Indian Prime Minister Jawaharlal Nehru was the political heir to Gandhi and spun Gandhi’s martyrdom into a weapon which he used against the advocates of Hindu nationalism and his own personal political challengers, Markovits wrote. Even more recently, Nathuram Godse and his actions still have an impact in India. In Nov. 2017 on the anniversary of Godse’s death, supporters of the Hindu Mahasabha paid tribute to their former member.